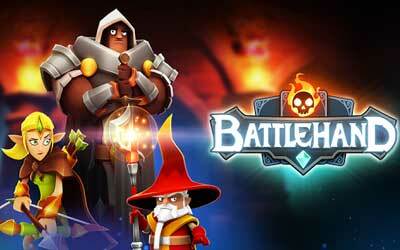 Previous version BattleHand 1.2.5 apk for Android will help you to downgrade or install older app easily. This is one of the best Role Playing apps. From the images we see, looks like a typical BattleHand card strategy game with a blend of elements of turn-based RPG battle as popularized Guardian Stone in 2015 yesterday. I do not know for sure whether the developer Another Place Productions, which previously known through Finga Dragon game, inspired by the Guardian Stone. What is clear, BattleHand has a unique visual and gameplay of its own to make it look clearly different from other cards strategy game. BattleHand game itself runs like a battle RPGs in general, where your attacks will be represented by the various commands on the screen. Due to these games include card mechanism, then automatically attack your character is doing can only be determined from the decks of cards, whatever you bring into battle. In the description, Another Place Productions claimed a total of ten characters hero, each complete with a storyline and a row of cards of their own attacks. Great graphics and smooth gameplay. Detailed and good quality. Only complain i would have is that the energy level cap is a little too low. Other than that its good. Great game so far enjoy the battles.